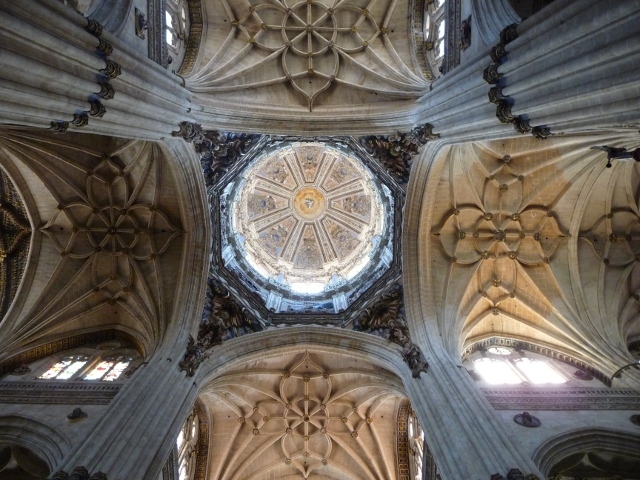 After Marvaõ, we were really intending to have a bit of a tonk across Spain – still with a feeling of slight disappointment after our time in Galicia. 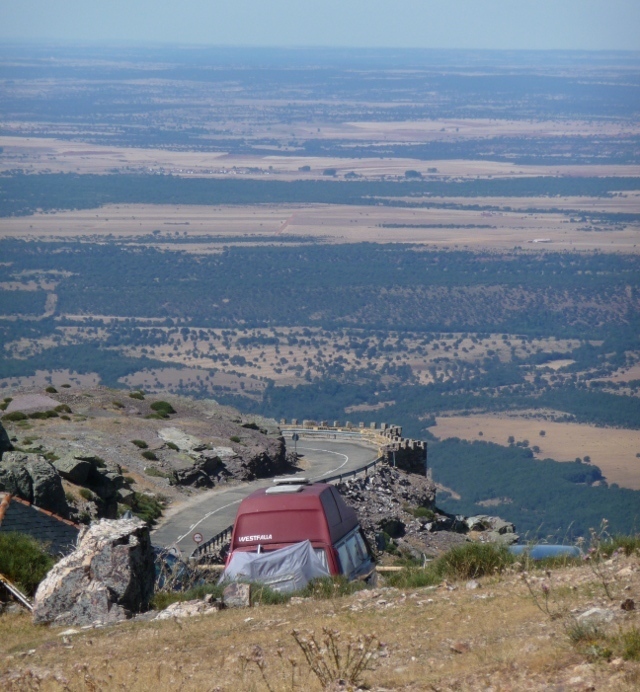 The plan was to stop in at Salamanca and Segovia, but otherwise just kill some miles and hope the scenery was decent. In the corner of our pitch was a small brick hut, containing our very own shower, loo & sink. Spacious and clean, we both wanted to just stay there until we got bored of the novelty. In the morning, reluctantly tearing ourselves away from Our Own Loo, we headed to have a quick glance at the old town before hitting the road. Several hours later, we were firmly in love with Spain again. Crammed with the most fantastic old palaces, churches and houses, it drips with atmosphere. But – much as we wanted to – we had to go. Pointing the van away from that town (and en-suite loo) was one of the hardest things to do on the trip so far. But a lot of distance lay ahead. The route to Salamanca took us via Ciudad Rodrigo. After some brain-wracking as to why the name rang a strong bell, a look at the guidebook prodded us. The story of the Napoleonic sieges of the city walls, first by the French (who were so impressed with the bravery of the Spanish defenders that they let them walk away from the city), then the re-taking by the British, had been recounted by Peter Snow (yep, the one with the election swingometer) at Chorleywood LitFest last year. The “Great Breach” blasted in the walls to allow Wellington’s troops to capture the place is still there, the only hole in the otherwise complete ring. The Cathedral’s frontage also still bears the scars of that day, with cannonball dents and missing bits of decorative frilliness. 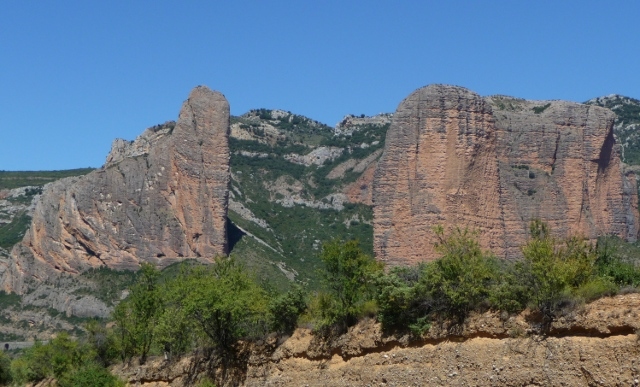 East of Rodrigo lay the mountains of the Sierra Peña de Francia. They’re crowned by Peña de Francia itself, topped with a monastery and look-out, at an altitude of about 1,800m. Apart from the few other members of the Sierra, there’s just flat plain stretching in every direction. Which means… Oh, dear. Yet another twisting, narrow road with hairpins and steep drops. We do so hate them… Or something. I know we’ve said a lot of views were incredible, but this really did take the biscuit. A full 360deg panorama, with no other peak within several hundred metres altitude. I don’t know how far you could actually see, but it just stretched and stretched – with tiny mountain ranges, cut out of fading shades of grey, stuck to the horizon. 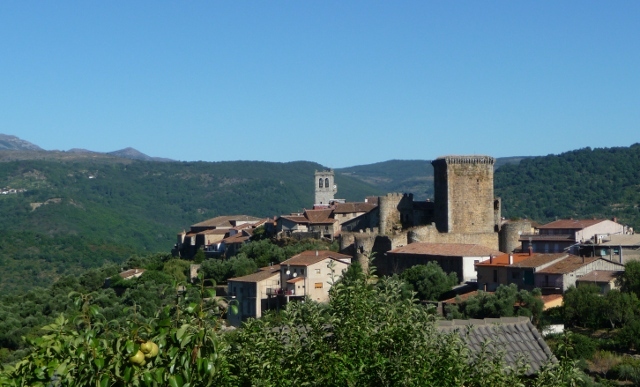 One of the best known parts of the Sierra is a village called La Alberca – declared a national monument in its entirety. It was pretty enough, but a bit too solidly touristy for our liking, reminding us of one of the better-known Cotswold villages – Bourton-on-the-Water, for example. 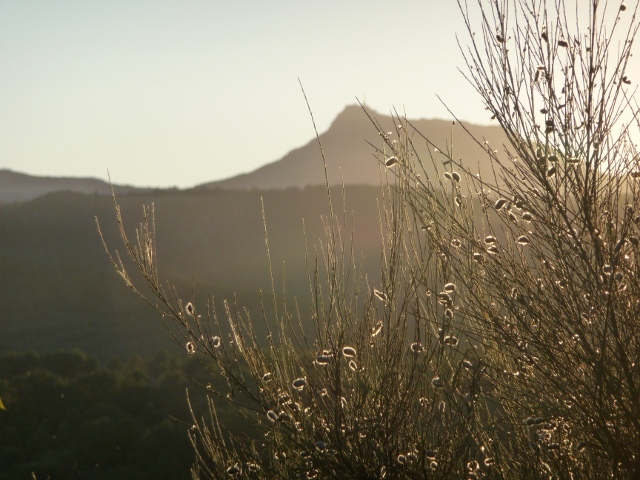 There’s a few village campsites in the area, and we stopped off at the one at Miranda del Castañar. Now that was more like it… Every bit as attractive as La Alberca (if not more so), but devoid of coach-trip-tourons. Just local residents, going about their daily lives in a town which looked unchanged for centuries. Finally, we arrived at Salamanca. An amazing city but, to be honest, a bit too “big city” for us. Don’t get us wrong – plenty of great sights (the Plaza Major in particular, but the New (15th century!) Cathedral, the Convento de San Esteban and the Casa Lys art nouveau museum, with a fascinating exhibition of the preparatory drawings of Hermen Anglado-Camarasa, also stood out) and atmosphere, but there was just that indefinable hum about the place. 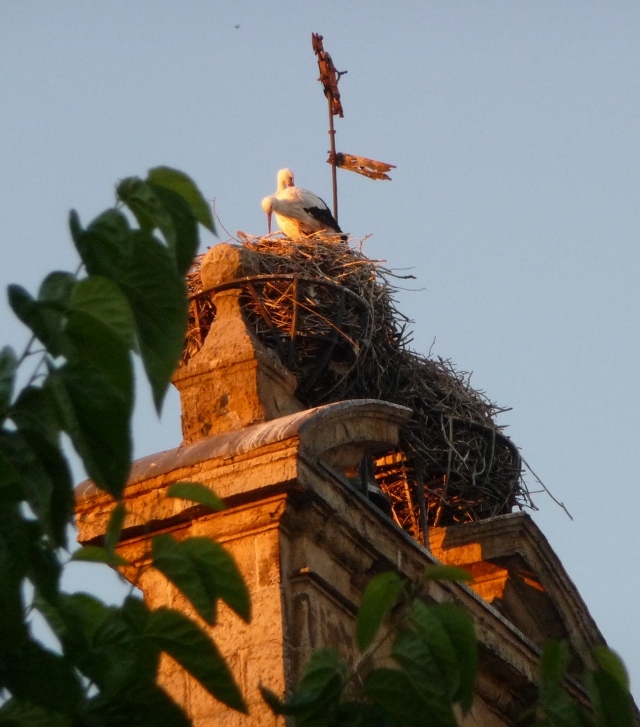 Still, we rounded off a very pleasant day’s wandering with an utterly superb meal, sat outside a small restaurant watching the sun set over church spires and stork’s nests. Avila next, home of St Theresa, one of Spain’s two favourites (St James – Santiago – being the other). Predictably, the pilgrim industry is well represented there, although low key. The reliquary was a must-see, containing her right ring finger, as well as the sole of a sandal and various other prosaic souvenirs. The finger itself was proudly displayed in a glass case – not just the bone we were expecting, but complete with dessicated flesh. Definitely a ring finger, since it was still wearing a ring, she must’ve been a big lass – it was much, much longer than you’d expect. The orange sea-anemone growing out of the tip was a little unexpected, too. Walking out from that, to promptly be faced with a row of thimbles in the gift shop, got me a sharp dig in the ribs from Ellie in response to a poor attempt to muffle spontaneous giggles. 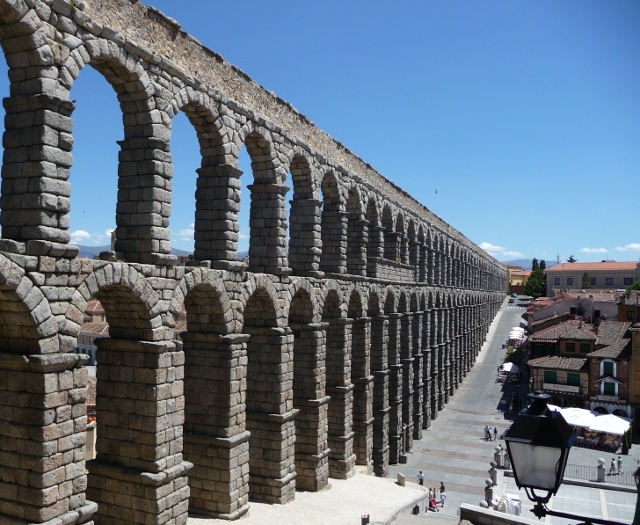 The final “name-brand” destination on this leg was Segovia, renowned for the Roman Aqueduct spanning the lower town. Effectively a dry-stone wall, held together solely with gravity and architectural genius rather than mortar, it was every bit as impressive as expected. The old town itself contained plenty of other diversions, too – from the Alcazar, a 19th century exaggeration of a castle, immediately familiar through being the basis for the further hyperbole of the original Disneyland castle; to the last major Gothic cathedral built in Europe, with more than enough arches and buttresses to be recycled into several more cathedrals. And so onwards again. The Cañón de Rio Lobos provided a spectacular backdrop to our night’s campsite, before Soria’s town hall and cathedral marked the end of scenery for a bit as we embarked upon a long, dry, dusty, flat, featureless plain; with only an unpleasant and steadily worsening clunking noise from the back of the van to give light relief. As the noise became more distinct and predictable, we diagnosed it as a failing constant velocity joint on a driveshaft. It could be kept quiet, so long as no steep ascents or descents were attempted, and acceleration and deceleration were kept light. Not good, given that we were heading rapidly towards the Pyrenees… As the pass of the Puente de Oroel loomed in front of us, we started to fervently hope that it’d continue to hold until we got to Jaca then into France. If it died once over the border, at least recovery wouldn’t involve international complexities, and we could be a bit surer of reaching the 2cv meeting. The Puente de Oroel gave us plenty of opportunity to question the wisdom of that decision, with steep narrow climbs and descents to provoke the joint into deafening us. The views were worth every gnawed fingernail, though – vertical fingers of stone in front of a backdrop of sheer rockface. By the time that’d been rectified, and the queue died down a bit, we headed for the Somport pass into France. There’s a major road tunnel under the mountains, and with a van making death noises at every opportunity, that would seem a far wiser option than climbing across the mountains. But that’s not our style, is it? 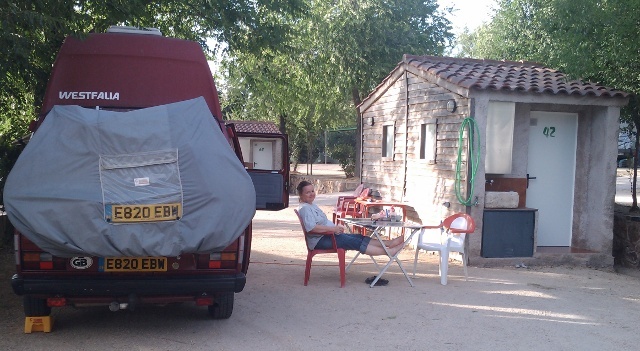 This entry was posted in By Country - Spain, Travel stuff, Van stuff. Bookmark the permalink.